New field presentation loudspeaker system consists of 4 drivers per each channel. Price of one driver was just 200JPY. 200JPY corresponds to 1.74USD (1USD=115JPY). Size of the driver was nominal 7cm (smaller than 3 inches but greater than 2 inches). The reason why I chose this driver was that the price was reasonable enough. Fostex drivers cost ten times or greater. 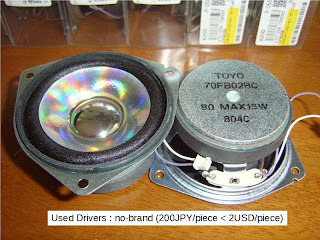 With these cheap drivers, the new field presentation loudspeaker system impressed enough. I felt it was more than loudspeaker system. It would be something else than being a loudspeaker system.